A very professional approach to the event, yet, at the same time a true community spirit was present and nurtured at all times. All that made the learning and the experiencing of the new simple and almost unnoticeable. Let us fertilize our lands well that the seeds could have a chance! It was my pleasure to meet you and to be part of this great learning and practicing experience, which gave me so much courage, hope, insights, learnings, joy and space at the same time. Thru it, I found some of great next steps of being better leader in my life and work. It was simply amazing also to see the process it self, where seniority is so supportive, nonviolently and gently hosting younger team members and at the same way so strongly holding the space for them and for all other attendees. Amazing organization/community, where all fits so unobtrusive, but so organize at the same time-a wish we could apply this way in our (business) organizations. It was a stop on my way, which has not ended. The event on AoPL in Planica will resonate in me for a while. I was already familiar with some of the approaches from the past, but the way this knowledge is shared is a total game changer. In my work I'm listening and talking about the future ways of being together in a co-creative manner, whereas the AoH people are actually doing it, living it. They designed an event framework in which everyone can learn, receive as well as offer, contribute, which is much more than a double win in itself. Another exceptional perception is how attentively they provide space for all generations to meet and to exchange at their best the wisdoms and the novelties. I experienced them as living best practice nomadic community on the eve of the emerging future. Being part of the calling and hosting team for the Art of hosting event in Slovenia, for me was 'a living example' that it is possible to create the co-learning, co-creating and co-collaborative community. And, with joy and strengthening bonds of friendship in the team! Factors of success, I would say, were very very strong commitment to make these qualities to manifest; based on very strong belief (and experience) that this is possible; with an immense trust and appreciation towards everybody, and of course experiences of senior hosts. In such a filed, as it was created in Planica, every human being can unfold his/her potentials in the benefit of all! Came cautiously, knowing not what to expect. Fell in the flow, learned to swim. Now eager to direct my own flow, started sensing the valleys between the mountains. I feel inspired and encouraged, by the connections I experienced the last three days in a learning community. A community in which souls choose to explore, choose to learn, choose to help, choose to teach, choose to support, choose to step forward, choose to speaking up with courage and give voice to their call. Initiators and contributors, both needed and both valued. Joining inner fire and carrying out, with great certainty, that even a little contribution, can be of large influence. In the last three days, many fires increased their heat and I feel grateful for sensing the power of it. I long to keep my fire burning, hoping it will meet up with others and co-create the change we want to see in the world. 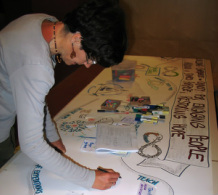 For initiating this empowering learning opportunity and offering a place to connect from heart to heart, I like to say THANK YOU to the team of 'THE ART OF PARTICIPATORY LEADERSHIP 2014, Planica / Slovenia': Marc Levitte, Janja Rebolj, James Ede, Jaka Kovač, Alenka Oblak, Ana Răducanu, Valentina MirtilloSmile, Tadej Pugelj, Laura Kaestele, Raphael Duret Nauche, Marjeta Novak, Dragana Prijanovič, Robert Krzisnik, Andreja Cepus, Natalija Vrhunc, Mary Alice Arthur! 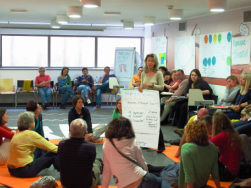 After receiving requests for an Art of Hosting (AoH)/Art of Participatory Leadership training from several circles, I contacted 10 people from Slovenia, who all had had some experience of the Art of Hosting Conversations That Matter approach, asking them whether they’d want to support an AoH training happen in Slovenia in May (a first in the last ten years!). To my surprise, all of them said yes. So did Mary-Alice Arthur and Marc Levitte, stewards within AoH community. Along the way, a few more people joined, and so we ended up with a 16-person hosting and calling team. Even though my rational mind at times got worried how it’d go, I now just can not imagine how we'd have managed without anyone of us! Both confidence and capacity of the Slovenian AoH community grew tremendously through our working elegantly together over these months. The connectedness & love that we nurtured among us (and with our international team) clearly spread out into the entire circle of participants during the training. Just after the training, two Slovenian lady participants (both of them seasoned leaders) came to me asking: “But how did you manage it – that the team worked so smoothly during the entire event??? What project management tools did you use?” Hmmm … we sensed together as a group into what we wanted to get done – and then simply asked who wants to take which piece. We simply did our best to “walk the AoH talk” I guess… No checklists, no PM tools. 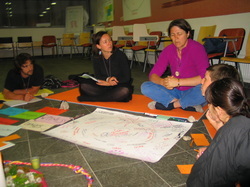 Due to the largeness of the team, many simultaneous activities during the training (the coaching of the participants, the daily harvesting, space and beauty care, conversations with (sometimes challenging) hotel staff, evening fires, morning practices …) could be in a flow, without anyone carrying too much on their shoulders. My own celebration came in the end, when I could clearly see how unique gifts of each and every member contributed to the Whole. What did we really, really want to seed & harvest with this training? About two months before the training, the local calling team sat together asking ourselves that question. We were positive we don’t want “just another training” – but sow seeds for a local AoH community and capacity. What came out of our deep sensing was an “endless loop” of hope/trust/self-confidence (in Slovenian: upanje – zaupanje – samozaupanje), which Tadej symbolised in the loop shared here. We want to restore hope in this time of sever crisis – and also after the event be a focal point for inspiration and learning with one another. This conversation was a shift that reinforced our own hope, trust and self-confidence in what we are doing. Around that time, James Ede joined the team; his passion for harvesting beautifully complemented our vision of seeding something that will grow beyond the training. Going with this flow, we already before the training created a series of follow-up events (of CoP, training and community service types): opportunities where the participants (and whoever else is moved) can come for further action, learning and companionship. Sensing together into which venue would best support our collective purpose brought clarity that (1) we want the training to be residential (with time for learning and connecting also in the evenings and mornings), (2) very affordable (to honour the dire economic situation in Slovenia, and (3) in a truly inspiring surroundings. For Slovenians, this means being in nature: we traditionally go to pristine nature to regain center and strength. So we decided for a venue surrounded by mountains and forest, even if the hotel/hostel was quite modest, and the main training room rather small and gloomy. We trusted the landscape/nature would support what we do – and so it did. We were blessed with good weather (unlike what the weather forecast predicted! ), and fully enjoyed many conversations with oneself, others, and Life while witnessed by mountainous keepers of memories. The question that I am pondering now is how could we more consciously (as AoH community) learn from, and with, nature … Slovenia (with its varied landscape) offers great possibilities in this exploration. A bow to everyone who has been with us on this journey – either at the center, participating, or holding us from the rim!